Christening BuffetCatering for friends and every member of the family. A child's Christening is such a happy family time and so we have devised a menu that has caters for people of all ages - choose your serviettes in pink or blue! 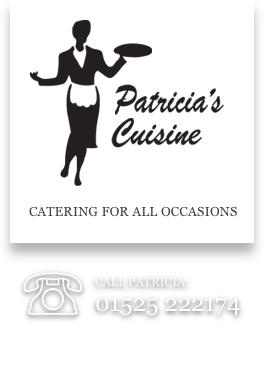 A Christening buffet can be whatever you want it to be so contact Patricia's Cuisine and let us help you with your catering choices. If you look at other menus on the website and would like to choose something from any of those then we can incorporate them into this menu - all our menus are interchangeable. Alternatively, if the Christening is being held when the weather's colder and you would like to cater for those with a preference for hot choices then please look at the hot buffet main meal menus. All above inclusive of paper or china plates, cake forks, serviettes your choice of colour & banquet rolling of main table if required.